Artist Residency at Bryn Mawr College, Philadelphia. I had a fantastic time on my artist residency at Bryn Mawr College recently giving an artist talk, delivering embroidery, digital and zine making workshops. Many thanks to everyone who came to my events and to everyone involved in organising my stay. You all made me feel very welcome. Here’s a lovely write-up of one of my workshops. It’s £15 for the two hour workshop. There are only 12 places so booking is essential. In December 2017 I was lucky enough to be invited to appear as the main artist in Arirang TV’s ArTravel Television Show in South Korea. It’s a travel program where artists visit different parts of the country and respond to the people and places they encounter. Here’s what I got up to on Jejudo Island. First Embroidery Workshop of 2019! I have three embroidery workshops planned for the coming weeks, two at the 155a Artists Space, East Dulwich (as part an exhibition of my work, full details in the previous post below) and one at Stanley Halls, South Norwood. More workshops on the way for 2019, but this is it for this year! I’m delighted to announce that I’ll be having a show of embroideries, prints and drawings at new gallery 155a Artists Space in East Dulwich. The show will feature new embroideries from my forthcoming work Threadbare, as well as prints and drawings from The Black Project and A Thousand Coloured Castles and my latest short comic Afterwords. All works will be for sale, plus there will be a pop up comic/graphic novel/zine shop. The show will run from Thursday 22nd– Monday 26th November from 10am – 6pm. There will be a private view on Thursday 22nd form 7-9pm. 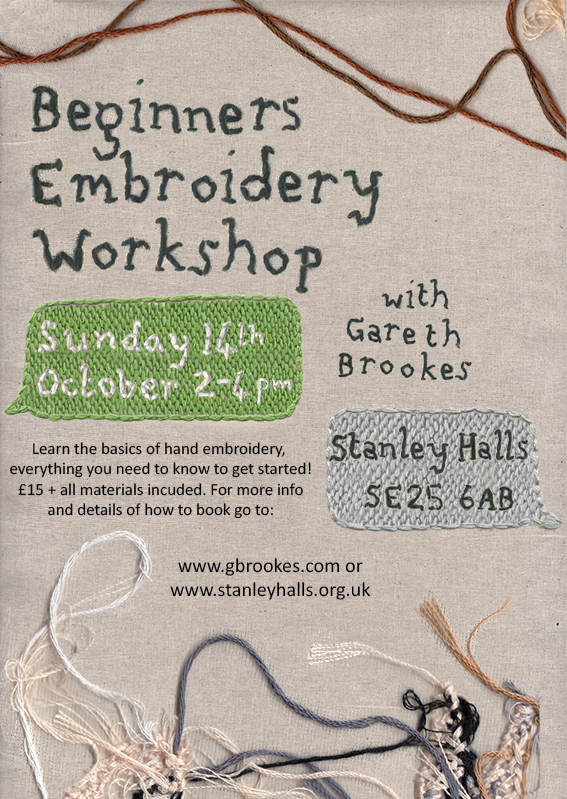 I'll be running two workshops next month at Stanley Halls South Norwood. 'Beginners Embroidery' on Sunday 14th October 2pm - 4pm and 'Beginners Monoprint' on Sunday 28th October 2pm - 4pm. Both will be a relaxed and fun introduction to the mediums, no prior experience needed and all materials will be provided. Kids are welcome but must be accompanied by and adult. Both of these workshops cost £15. Please book in advance. If you have any questions please contact me through the contact form on the info link above. I'm very happy to announce that my first small press comic in four years is now here and available in my online shop. 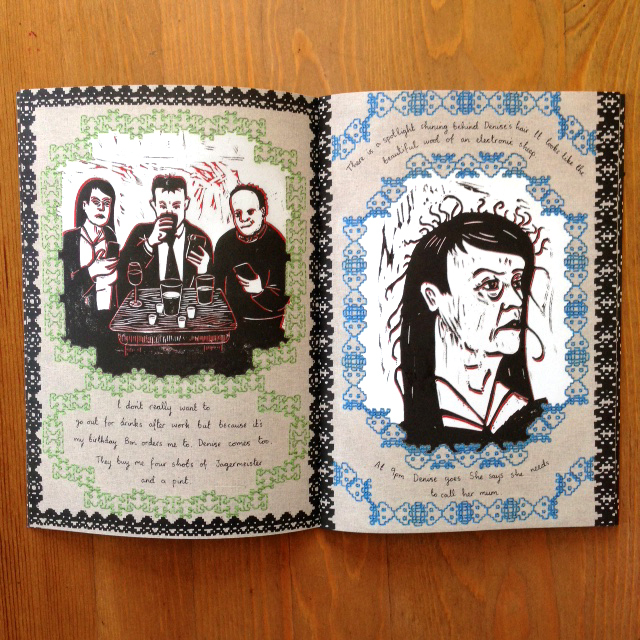 Afterwords contains two short comics, sequels to my graphic novels The Black Project and A Thousand Coloured Castles. Both take place in a near, if somewhat dystopian future and follow the familiar characters as they struggle to adapt in a strange new world. The comic uses the same techniques used in the graphic novels. Embroidery and linocut printmaking for The Black Project sequel and wax crayon for the sequel to A Thousand Coloured Castles. I'd like to reassure readers new to my work, the stories can be read as stand alone pieces. More info can be found in my online shop here. Last week I went to the 2018 Festival de la Bande Dessinée in Angoulême where the French edition of The Black Project had been nominated as part of the prestigious Sélection Officielle. Although we didn't win the big prize this time, I had a great time, and learned a lot about the French comics scene and picked up some beautiful international comics. As 2017 draws to a close I'm thinking ahead to next years output. There are three short projects I've been dying to get round to, and I'm thinking 2018 will be their year. To this end, and in order to raise a bit of extra cash for materials, I've started a Patreon, where I'll be posting updates, pages, plus detailed process pictures and videos. Rewards start at $1, so go take a look! I've also opened an original art shop, selling drawings and embroideries from The Black Project and A Thousand Coloured Castles . Prices start at £25 and I'll be updating regularly so go take a look at that too! Here are some pictures of my work in the recent Storytelling City Exhibition at The Gallery in Hongdae. I produced the embroideries and drawings for an online comic in collaboration with the science fiction short story writer Soyeon Jeong. Embroideries, including a burnt one. Here are a few pics for my solo exhibition at WAR gallery which opened on the 4th August. Show continues until the 7th Sept. All work is for sale! I'm having a show of my original artwork, including embroideries, prints and crayon drawings from A Thousand Coloured Castles, at WAR Gallery, 16 Eltham Road, SE12 8TF. The show runs from 4th - 30th August, with an opening happening at 6pm on Friday 4th. Here's a link to the Facebook Event page. Recently I've been in Seoul, taking part in an exchange between the WOW festival and the Bradford Literary Festival, funded by the British Council. The project will result in a collaborative piece to be revealed at the WOW festival in September. Here's myself and project partner, the short story writer Soyeon Jeong, being interviewed about the project for Magazine GraphicNovel in Seoul. 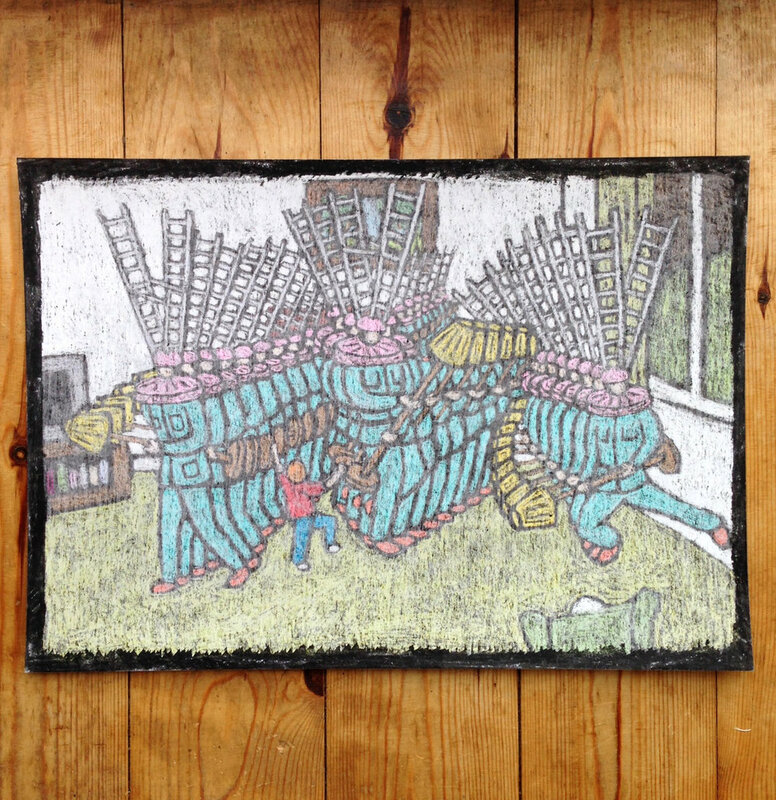 A Thousand Coloured Castles is out now! My latest graphic novel A Thousand Coloured Castles is now published by Myriad Editions and is available in my shop and in all good bookshops. It will also be released in the U.S. by Penn State University Press this coming August. I'm having a launch party for my new graphic novel A Thousand Coloured Castles at Gosh! Comics and everyone's invited! More info about A Thousand Coloured Castles plus details of how to pre-order the book can be found here.